Percy Westlake received shrapnel wounds to his right knee and abdomen on 8/2/1942. Soldier was a Fairbridge Farm Boy. Percy Westlake arrived in Australia 4/1/1927 on the SS ‘Ballara’ from London aged 10 years with his older brother George Arthur Henry Westlake aged 12 years. Both boys were housed in ‘Glasgow’. Their parents George (Snr) Westlake aged 34 years married Marie Adele Magenis at Aldershot, Surrey. George has served in WW1 with Gloucestershire Regiment Service No. 36739. It is not known how the children entered the Child Emigration Scheme, whether from another children’s home – these were challenging times with much of England living in poverty. Whether the Westlake’s were no longer able to care for their children due financial difficulties or the marriage broke down, or perhaps George had ongoing health problems from his WW1 experience – we do not know. Remember there were no social services available – the only options for families who were unable to look after their children was to place them into care. Often it was planned that parents would get back on their feet and return for their children. George Westlake (Snr) died in 1935 and Adele Westlake died many years later. In 1935 and 1936 Percy was working for T, Boyd Esq., Keysbrook. The above was published in a WA Newspaper in 1933. Percy would have been about 16 years of age. Another well-adjusted boy from Fairbridge!! Percy was selected for ‘D’ Force S Battalion to work on the Railway. 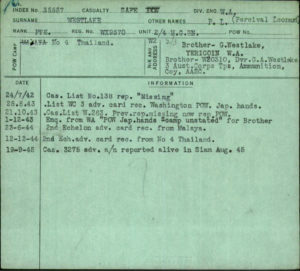 This party contained one of the largest numbers of 2/4th men so we can be assured Percy had plenty of mates with him when they were crammed into the small railway trucks at Singapore Station heading to Thailand. 28-30 men per carriage the trip took 4 -5 days. The nights were cold and the days stinking hot. The men taking turns to sit at the open doors, perhaps lay down a short time. Percy’s first destination was Kanu II Camp – cutting through rock in the area known as Hellfire Pass. The conditions were horrific with men dying of Cholera and other diseases, injuries and the dreaded ulcers. 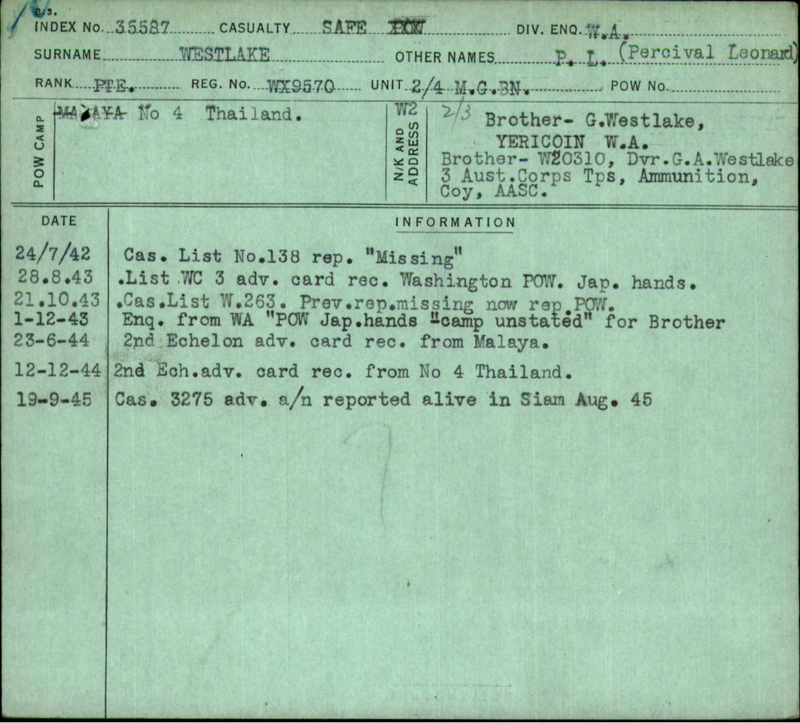 He was recovered from Nacompaton Camp Thailand at the end of the war on 16th August 1945. He was discharged on 25th January 1946. In 1951 Percy married Elizabeth Alice Augusta Tooth (nee Anderson). They resided in Victoria Park for most of their lives. In 1980 they were recorded residing in Berwick Street and Percy was employed by the Railways. Elizabeth died in November 1990. Percy died 28 October 1999. He is buried at the Calingiri Cemetery where he had spent much of his time with his brother George. The two brothers remained very close throughout their lives.